JCCC’s 15 three-pointers hold off late KCKCC challenge, 79-72 – Welcome to Wyandotte Daily! 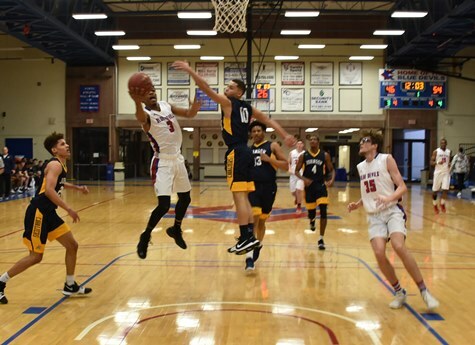 Kansas City Kansas Community College’s ‘Super Six’ dominated the rebounding, missed only one free throw and had just as many field goals as Jayhawk Conference leader Johnson County Saturday. But the Blue Devils couldn’t withstand sizzling outside shooting by a trio of Cavaliers in a 79-72 loss that was a four-point game going into the final minute. The win kept JCCC atop the Region VI standings at 6-0 while KCKCC remained in a three-way tie for fourth place with Hesston and Labette at 1-5 with four games to go. On the road at Hesston Wednesday, the Blue Devils return home Saturday to play Fort Scott in their final home regular season games at 2 and 4 p.m.
Again playing with just six players, the Blue Devils (8-18) led by as many as six points midway through the first half in a game that was tied seven times and had 11 lead changes. Deadlocked 35-35 at halftime, JCCC (14-12) used four 3-point field goals for a 12-5 run and a 47-40 lead in the first four minutes of the second half and later in the half again put together four consecutive 3-pointers to turn back each challenge before KCKCC made one last bid. A layup and a 3-pointer by Juwan Davenport sliced the JCCC lead to 72-68 with 1:28 left but the Cavaliers’ Xavier Womack slipped between two defenders for a layup with 59 seconds to seal the win. 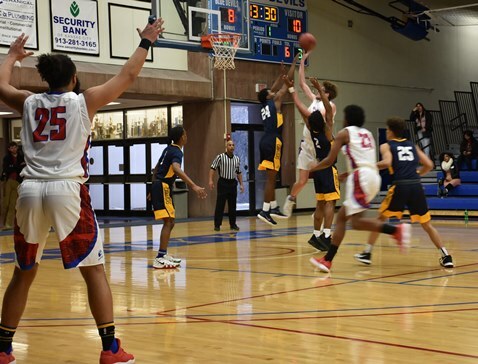 Playing a tight zone defense, KCKCC had a 45-28 command of the rebounding including 16 offensive rebounds that contributed to 25 second half points. The Blue Devils also made 15 of 16 free throws and matched the Cavaliers in field goals – KCKCC converting 27 of 62 for 43.5 percent, JCCC 27 of 61 for .443. The difference came from long range, JCCC winning the battle of 3-pointers 45-9 by making 15-of-30 to 3-of-13 for KCKCC. “They killed us on the boards,” JCCC coach Mike Jeffers said. “But we made the extra pass, were unselfish and made the shots.” Indeed, the Cavaliers had 18 assists on 27 field goals and turned the ball over just three times to 12 for KCKCC. KCKCC got standout performances all around. Tyson Beringer had a double-double with 19 points, 15 rebounds and a couple of blocked shots in his best performance of the season. Josiah Laws also had a double-double, his first with 14 points and 10 rebounds in his best effort. Davenport led the scoring with 20 points and consistently broke JCCC’s press. Malcom Tate scored 11 points; and DuVonte Beard led in assists with six, scored six points and grabbed four rebounds. A trio of Cavaliers accounted for 60 points as they combined to make 15-of-26 3-point shots. Anthony Lupardus had 24 points (6-of-12 from 3-point) and Berlin Roberson (5-of-8) and Mat Baldeh (4-of-7) 18 points each. The JCCC win sets up a season-defining clash of first and second place teams Wednesday night as Highland (5-1) comes to Overland Park in a twin bill that also matches the No. 3 Highland women (6-0) and second place JCCC. Highland defeated Labette 91-69 Saturday while Fort Scott was beating Hesston 100-69.